Many Men & Women all over the world. Many of my customers ask me for some remedy, treatment and solution for dark circles. 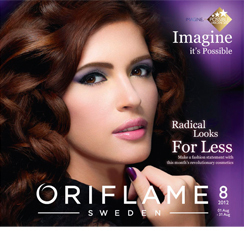 As an Oriflame Beauty Consultant I give them my advise. But before we look at what Oriflame has to offer to solve the problem of Dark Circles lets look the causes, some home remedies and some tips to overcome dark circles. Any one or more of these can cause. And to be frank this is not an exhaustive list. These are common causes of dark circles under the eyes. Dark circles may sometimes be caused by toxins in your system. In which case its important to detox the system. But generally, due to the above causes, the blood circulation around the eyes is not at the optimum level, which causes dark circles. Everyone knows of some home remedies for dark circles, usually given by their grand-mom and every grand-mom has their a favorite remedy for dark circles. These home remedies will sooth and relax the eyes and the surrounding area. This is especially important if you've been up late in the night. Keep thin slices of cucumber on your eyes. You can use home remedies for dark circles along with your eye cream for dark circles. Eat plenty of fruits and vegetables, especially green leafy vegetables. Avoid processed foods with artificial colors and preservatives. Take a vitamin supplement, adequate fluids and reduce salt intake. Just before going to bed, take a piece of cloth and wet it with cold water and place it over your eyes as you sleep. Apply the under eye Cream and treat your skin while you sleep and remember that long-term daily use has the greatest positive effect. Inadequate sleep results in dark circles under the eyes, so take 7-9 hours per night. Wear dark sunglasses to protect your skin during the day when you are out in the sun. Do some relaxation exercise or Yoga. Relaxing helps reduce stress and anxiety and helps you get enough sleep. Drinking two glasses of fresh juice a day. After a week you will start noticing a difference. In addition to using the home remedies and following the helpful tips you can use the following proven products to aid your skin in recovering its natural shine. First I would recommend Optimals Even Out Dark Spot Fading Concentrate, 10 ml. This is a concentrated cream that guarantees a clear complexion with balanced color. Enriched with natural complex Pro-white, licorice extract and vitamin C Optimals Even Out Dark Spot Fading Concentrate reduces excessive pigmentation and prevents further discoloration. Apply morning and evening on discolored skin areas. For best results it is recommended to use in combination with Optimals Even Out Day & Night Cream SPF 20. Both the Dark circle under eye treatment creams are available in India through Independent Oriflame Consultants in all major cities. MRS CHAYA FARANDE Says " It's a miracle. Applied after toning, and under (targeted spots) even out day cream...good results. skin looks natural..
MISS SUNITHA RAMAYYAN Says "Must use this product. People who suffers from high pigmentation. This is the first product from Oriflame I have used with even out day cream. Both are awesome. I hope this has been a helpful post for you. Please feel free to share your knowledge on the subject or your thoughts, ideas, tips on dark circle under eye treatment and products in the comments section below. I would recommend Optimals Even Out Dark Spot Fading Concentrate in combination with Optimals Even Out Day & Night Cream SPF 20. Please call or WhatsApp me on 9820850522 if you want to order the products through me. Big name manufacturers commonly put harmful chemicals instead of all natural ingredients into their products. They have a motive for doing it that you should know about.